BLACKSBURG, Virginia, June 12, 2014 (ENS) – The poison ivy itch of summer could become a thing of the past for the millions of people who are allergic to the plant if the findings by Virginia Tech researchers are commercialized. Scientists in the Virginia Tech College of Agriculture and Life Sciences have found a naturally occurring fungus that grows on the fleshy tissue surrounding the plant’s seed, potentially giving homeowners and forest managers the ability to rid landscapes of the pernicious pest. The study published this week in the journal “Plant Disease” is a first of its kind on poison ivy, a plant that affects millions but has had little research done on it. Most of the science has been focused on urushiol, the rash-causing chemical found in the plant’s oils. John Jelesko, an associate professor of plant pathology, physiology, and weed science, began studying the plant after experiencing a nasty poison ivy rash himself while doing some yard work. Urushiol is extremely potent. Only one nanogram is needed to cause a rash, and the oil can remain active on dead plants up to five years. Yet only humans are allergic to urushiol. 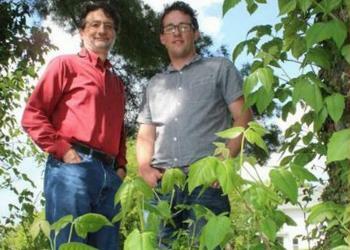 Rather than focusing on urushiol, Jelesko set about studying ways to kill the plant itself. He worked with Matt Kasson, a senior research associate in the same department. Their work is valuable in view of a 2006 study showing that as the planet warms, poison ivy is predicted to grow faster, bigger, and become more allergenic, causing much more serious reactions that could send an increasing number of people to the doctor for prescription medications. The research team discovered the killer fungus in their initial attempts to generate microbe-free poison ivy seedlings to use in their studies. Jelesko noticed that not only were some of the seeds failing to germinate, but on the seedlings that did germinate, there was a blight wiping out the young seedlings. Jelesko enlisted the help of Kasson to isolate what he suspected was a fungus causing disease in the plants. The team discovered that the fungus was growing on all the plants that died and the seeds that didn’t germinate. Though herbicides are available to kill poison ivy, Jelesko and Kasson said that if this fungus were developed into a commercial application, it would not only be more effective than its chemical counterparts, but also has the benefit of being completely natural. “We have to keep in mind that the chemicals used to control poison ivy are general herbicides, meaning that they will affect and probably kill many other plant species, so their use in large areas is not always practical,” said Thomas Mitchell, associate professor of fungal biology and molecular genetics at Ohio State University who is familiar with the research but not affiliated with it. “This work shows promise for an alternative approach to the use of chemicals and has great potential as a biological control alternative. This type of approach, using native pathogens to control noxious and invasive plants, is gaining more much deserved recognition,” said Mitchell. Kasson, whose research is funded by the U.S. Department of Agriculture Forest Service, believes it would be relatively simple to develop granules to spread on top of poison ivy-infested areas in yards and recreational areas such as campgrounds to naturally infect the plants and kill them. After Kasson successfully isolated the fungus in pure culture from infected plants, a DNA analysis revealed that the fungus, Colletotrichum fioriniae, is also widely known as an insect pathogen that kills an invasive bug that infests and kills hemlock trees. Jelesko and Kasson have filed for a patent disclosure of their findings, and say that this research just scratches the surface of possible avenues for the study of poison ivy.